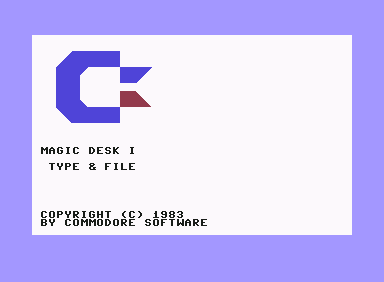 Released in 1983 by Commodore, Magic Desk I is a ROM cartridge that presents the functions of the computer as a virtual desktop. 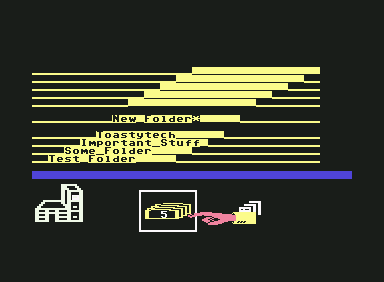 The product was described as an attempt to make the Commodore 64 "people literate" (as opposed to making people "computer literate"). Produced during the "user friendly" frenzy of the Apple Lisa, Magic Desk I is interesting because it was an attempt to bring a similar visual metaphor to a much less powerful but more common home computer. In many ways, it feels similar to the interface used by the later Magic Cap PDA software. However Magic Desk I is rather primitive and quite lacking. Both the name and missing functionality imply this was to be followed up with an improved version. However no "Magic Desk II" was ever released. Magic Desk I starting up. 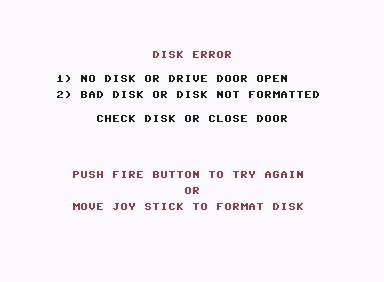 Because it is a cartridge, it starts up automatically, and faster than loading from disk. This is the Magic Desk I desktop. It presents you with a desk, typewriter, file cabinet, clock, and trash can. 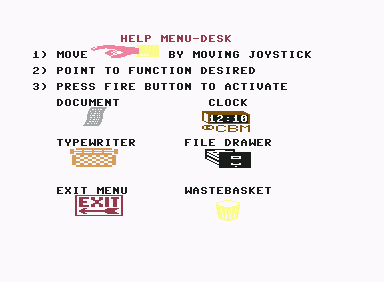 You move the "hand" with a joystick to select the item you want. Notice the door, calculator, phone, card file, and dollar bill graphics. Trying to select these does absolutely, completely, and totally nothing. That's right, they don't do anything. At all. 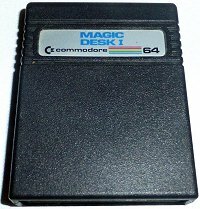 This leaves one to speculate if these were supposed to be features of "Magic Desk II", parallel release versions to the "Type and File" cart, or future disk based utilities. Either way, the typewriter would have looked lonely on the desk all by itself. Instead of embracing the advantages that a computing device can bring to text editing, Magic Desk simulates a typewriter. The text on the screen even scrolls back and forth left and right as you type while the green "cursor" remains in the center. There are no block editing commands such as copy/paste. Using the icons at the bottom of the screen, you can return to the desktop, set tabs, return to typing, print what you have typed, or put your document in the trash. Once you have typed some text, a graphic of a sheet of paper appears above the desk. You can select the clock to the time. If a document is present, you can select the trash can. This will put the piece of paper in the "trash", and it will be gone when you leave this screen. The content of a document is stored in RAM until it is saved to disk. You do that by selecting the file cabinet. The error handling in Magic Desk is rather poor. For example, if you select the file cabinet while there is no disk in the drive, it keeps you here until you insert a disk, and gives you no option to go back. Thankfully here in the enlightened, far off future we would never make such a hideous mistake.... oh wait, I ran in to that in Windows 8! The file cabinet has three "drawers" you can select. Each drawer is already populated with a set of yellow "folders". You then select a folder, give it a name if needed, and then click on the "files" icon to continue. Similarly, each "folder" is already populated with a number of files. If there is a document in memory you will see a document icon in the upper left. To save the document, select a file, give it a name, and select the "disk" icon. To load a document, select a named document, and select the document icon at the bottom. If you selected a document to load, it shows a preview before returning to the desktop. You can scroll this preview similar to the editor, and it again gives you the option to delete the document using the trash icon. Magic Desk also has some built in help. Pressing Control shows this screen, and selecting one of the icons will show some more information. 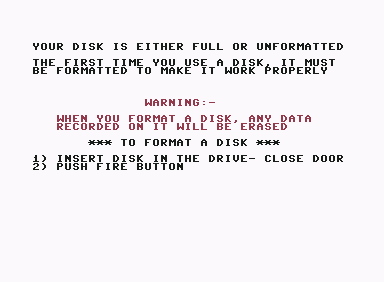 Wow, it really wants to format that disk! The disk is full, so let's reformat it? Great idea. That is really about all there is to Magic Desk I. 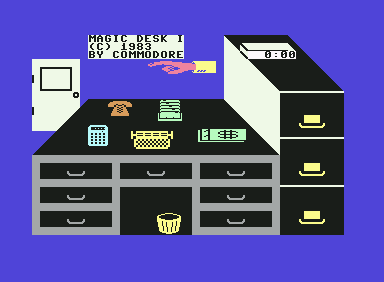 In conclusion, were it more refined and complete, it probably would have been a decent tool for novice C64 users. 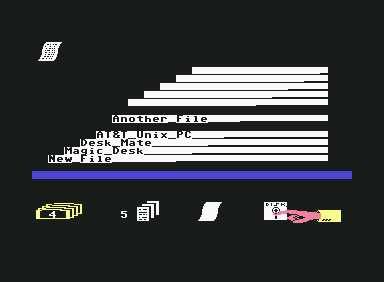 A real Mac-like desktop came to the Commodore 64 later in the form of GEOS.